Perched on an isolated rock in the Scottish Hebrides, this is a fascinating account of Skerryvore, ‘the most graceful lighthouse in the world’, and the great Victorian engineer who designed and built it. At a height of 48m (156 feet), it is the tallest lighthouse in Scotland. 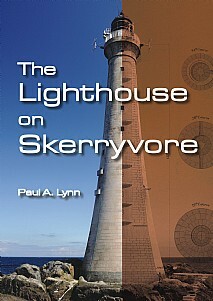 The story of the Skerryvore lighthouse and its creator, Alan Stevenson, is remarkable by any standards. Here was a man of exceptional intelligence and wide-ranging ability who overcame Herculean challenges over a six-year period to place a lighthouse on an isolated rock in the wild North Atlantic, 12 miles off the Hebridean island of Tiree. He was a brilliant and complex character, much loved by his family and those who knew him, but beset with self-doubt. His is a moving and truly amazing story just waiting to be told. Reading Alan Stevenson’s 1848 Account of the Skerryvore Lighthouse, the author immersed himself in Skerryvore through the mind of its creator, using his background as a professional engineer to assess the state of knowledge at the time, and to learn all he could about its background, technical design, and the many trials and tribulations surrounding the lighthouse’s construction. This highly readable book, illustrated in full colour with beautiful old maps, engravings and photographs, also contains introductory material about Eddystone and Bell Rock Lighthouses that greatly influenced Alan Stevenson in his design and construction of Skerryvore. Snippets of personal reminiscences and fascinating historical perspectives on the West Highlands give readers a wider view, encouraging them to visit Tiree.